Not really a sea but in fact is the largest inland lake in California. It is salty and thus the name. 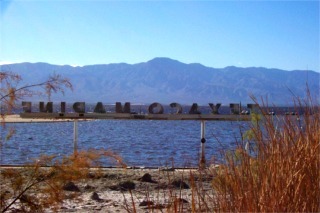 The Salton Sea was formed between 1905 and 1907 when the Colorado River burst through poorly built irrigation controls south of Yuma, Arizona. 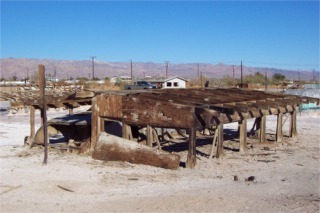 Almost the entire flow of the river filled the Salton Basin for more than a year, inundating communities, farms and the main line of the Southern Pacific Railroad. 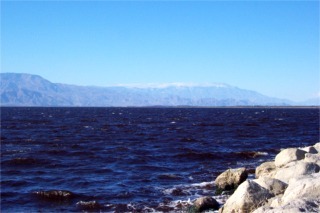 The Salton Sea is currently 35 miles by 15 miles and can be as long as 40 miles by almost 20 miles wide in particularly wet years. It has an average depth of 29.9 feet and, at its deepest, is 51 feet. 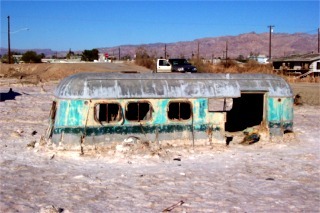 Presently, the fishing in the Salton Sea is thriving. Salinity is slightly more than the Pacific Ocean. The current salt level of the Sea is just slightly higher then the Pacific Ocean but less the the Great Salt Lake in Utah. 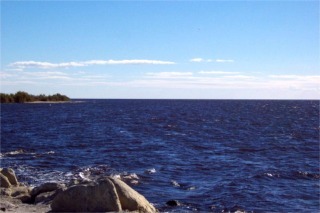 If the concentrated salt level of the Sea increases greater than 44 Parts Per Million (PPM), currently it is 41 PPM., it is expected that all the fish, except the Tilapia, will cease to reproduce. Tilapia can survive up to 60 PPM..
Rare tropical storms in 1976 and 1977 caused this trailer park and home area to sink. It is really odd because some buildings here are partially submerged and others aren't. They are surrounded by a crust of salt. As the sun evaporates the water, salt is left. Developers envisioned this area in the late 1950's as a playground that would have summer year round. Development started at the north end. It was touted as a $2 million marine paradise with one of the largest marinas in Southern California. 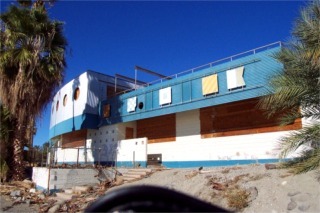 This was the Salton Bay Yacht Club. Boat racing became very popular. The Beach Boys, Jerry Lewis, and the Marx Brothers were a few that visited the club or kept boats in the marina. At this moment I have not been able to determine why the people left. But, I am sure I will stumble on something to shed some light on it yet.